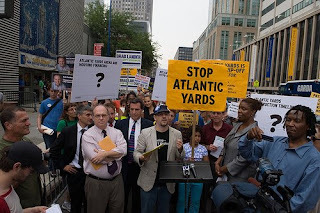 In the end, the first day of the public hearing on the revised Atlantic Yards plan, though hardly uneventful, was less raucous and more lightly attended than many expected. 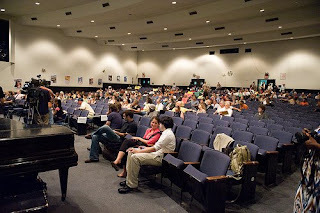 Many, but hardly all, of the arguments recycled those at the epic public hearing held on 8/23/06. The key new argument for opponents and critics emerged from information--or, more precisely, the lack thereof--from the Empire State Development Corporation (ESDC) and developer Forest City Ratner (FCR). The absence of a site plan, arena renderings, economic projections, a solid timetable, and a meeting with the cops over security informed a series of arguments, backed by several elected officials, that the approval is premature. They called for either a Supplemental Environmental Impact Statement or for the project to be scrapped. The most telling piece of theater occurred when Develop Don’t Destroy Brooklyn spokesman Daniel Goldstein went up to testify and, before speaking about “a sham process for a sham project,” methodically altered the landscape behind him, placing placards with question marks over the three ESDC-provided panels that offered minimal information about the project as it stands. DDDB had both local elected officials as well as several candidates for two City Council races--in districts near the project site--in its corner. Meanwhile, project supporters, notably from the construction unions and the housing advocacy group ACORN (left), reiterated their call for jobs and housing, arguing that the economic situation made it more rather than less important to move ahead. (ACORN has been bailed out by Forest City Ratner.) 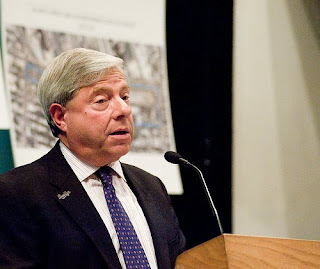 Along with Borough President Marty Markowitz, the elected officials testifying (or sending representatives) supporting the project mostly came from Southern Brooklyn and other areas more distant from the site. 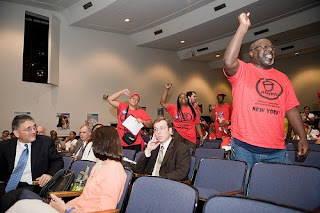 Despite the periodic sound and fury, the event--given that no one official was supposed to answer questions--was far less enlightening than the July 22 informational meeting hosted by three community boards, where representatives of the ESDC and FCR were forced to answer or evade questions from the public. Several ESDC executives (right) were in attendance, but no board members were present. Though numerous red-shirted representatives of ACORN got up to speak in the second segment, the hearing actually ended 15 minutes early, with no one left to offer testimony. Then again, yesterday was more a media event than a public hearing, given that the ostensible formal changes--a revised deal with the MTA and a delayed plan for eminent domain--are largely expected to be approved without question by the ESDC board in September. Several people signed up to testify, both pro and con, were no longer in the room when their names were finally called. In fact, some of the big names didn’t bother to testify but instead spoke at dueling press conferences, one by opponents outside the event before it began, and one by proponents, in the auditorium hallway even while testimony continued. That made sense; their presence was more to influence the media than the ESDC. Given concerns about behavior at the packed, epic 8/23/06 hearing as well as last week’s informational meeting, the ESDC set ostensibly strict rules, with a digital clock counting down a speaker’s allotted three minutes, with a chime announcing that they had 30 seconds left and another indicating that time was up. 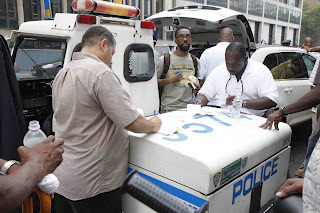 With numerous New York Police Department community relations officers in attendance, as well as campus security guards, the situation was mostly under control. 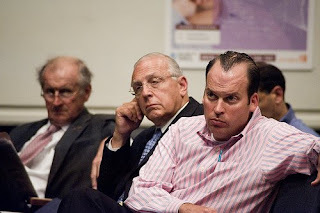 At times, they had to remonstrate with hecklers and others arguing, but only a couple of people were ejected, notably Goldstein, who was outraged when Assemblyman Alan Maisel declared that "a small group of people should not be deciding what happens to our borough"--a slam at DDDB and its supporters but, they'd say, exactly a description of the unelected board of the ESDC. Goldstein later returned to the room. The cops also kept watch on--and, at times, quieted down-- the Forest City Ratner-organized hallway press event, less a press conference than a rally. No representatives of the developer spoke. Featured were State Senator Marty Golden, the Partnership for New York City’s Kathryn Wylde, union leaders Gary LaBarbera and Sal Zarzana, and Community Benefits Agreement signatories Bertha Lewis (of ACORN) and the Rev. 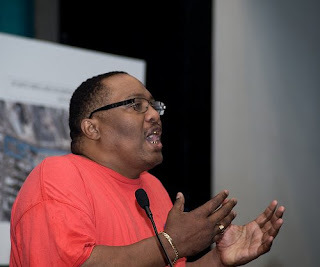 Herbert Daughtry (of the Downtown Brooklyn Neighborhood Alliance). Then again, the project supporters probably heckled more. At one point, a group of men chanting about jobs drowned out an outdoor press interview held by Queens City Council Member Tony Avella, a project opponent and mayoral candidate. There were some, but relatively few, moments of rapprochement. One project supporter acknowledged that the benefits had declined but the project was still worth it. And the recent production by BrooklynSpeaks and the Municipal Art Society of a chart comparing project promises from 2006 to 2009 got respectful attention from at least some proponents. 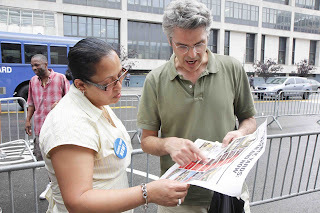 In photo at right, Peter Krashes of the Dean Street Block Association goes over the chart with Delia Hunley-Adossa, chairperson of the AY Community Benefits Agreement coalition. 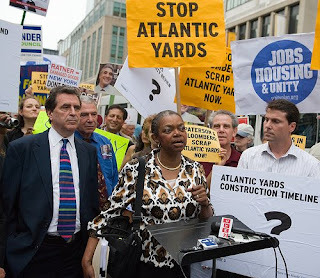 Among attendees, opponents included City Council member Letitia James, Assemblyman Jim Brennan, State Senator Velmanette Montgomery (at podium below, with Siegel), and a host of candidates, including Public Advocate candidate Norman Siegel, longshot Mayoral candidate Rev. Billy Talen, and several candidates for the city council seats in the area around the project--a group that, Goldstein suggested, would not have been with them five years ago. As at the meetings last month of the ESDC and Metropolitan Transportation Authority (MTA), representatives of several groups and institutions in the Downtown Brooklyn area--notably the Downtown Brooklyn Partnership, the Brooklyn Academy of Music, and Long Island University--spoke in favor of the project. Among opponents, beyond neighborhood groups such as the Atlantic Avenue Betterment Association, the major presence was the Municipal Art Society, which has updated its warning of “Atlantic Lots,” featuring indefinite interim surface parking. Along with the elected officials mentioned above, 33rd District candidates Ken Baer, Ken Diamondstone, JoAnne Simon, and Evan Thies were present; so too were 39th District candidates Brad Lander, Josh Skaller, and Bob Zuckerman. Given that they had to wait their turn to speak at a fairly brief press conference, several of them seemed to be a bit impatient. “It’s a racist attempt to divide the community,” James said, referring to the considerable racial tension that has periodically arisen during the conflict. “Yes,” shouted Beverly Corbin, a tenant activist from the Wyckoff Houses who’s also black. He noted that the MTA deal with Forest City Ratner allows a 22-year payment schedule, which he declared--though the ESDC wouldn’t admit it--stands as the construction timetable for this project and asked, "Does anybody believe it’ll be over in 2031?" He predicted that ESDC would rubberstamp the project and people would continue to litigate. Author and former Congressional candidate Kevin Powell said some people thought he was brainwashed for opposing the project. “This is about greed,” he said. “We’re not going to stop until the Nets stay in New Jersey permanently." 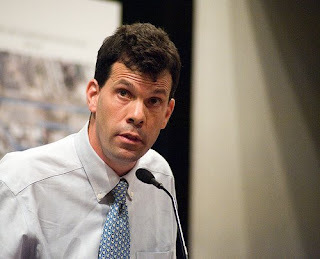 Siegel, who formerly represented DDDB and now represents a property owner resisting the use of eminent domain for the Columbia University expansion, said that New York’s processes were uniquely favorable to the state, given the lack of opportunity to challenge a taking in a trial court. “When Daniel is talking about it being a sham, he’s understating it,” Siegel said. Later, when testifying, Brennan pointed out that the state is ignoring evidence from the New York City Independent Budget Office that the arena is likely a money-loser for the city. Beyond that, he said, the state is “pretending that the recession does not exist;” rather, he said, the recession has killed the commercial office market and the luxury condo market. The fiscal impact statement in recent ESDC project documents, he said “is just a statement; it has no backup documents” and assumes the presence of a commercial tower that is unlikely to be built. Later, Assemblywoman Joan Millman testified, acknowledging the difficulty some elected officials have had in taking a firm stand. “When I first testified in Octobe 2005 I recognized that the arena and the affordable housing and the union construction jobs were benefit to Brooklyn but the government subsidies, use of eminent domain. and size of proposed project was too high a price to pay,” she said. Maybe, maybe not--a lot of people still would’ve protested the arena. When Borough President Markowitz spoke, a couple of people stood up and turned their backs to him in silent protest. “I would never any support any project that I didn’t believe was in the best interest of this borough today and for the years to come,” he said, reading his testimony rapidly. He again said he was confident that the project, when completed, will serve as a model development and that current opponents will support it someday. “For more than 100 years,” the “empty” railyard has been a barrier between neighborhoods, he said, somehow ignoring that it has been a working railyard. He again said that AY was the right project in the right place at the right time, closing to loud cheers and boos. Along with Maisel and Golden, respresentatives of Congressman Ed Towns and Assemblyman Steven Cymbrowitz were present, both of them mangling some facts. A few candidates supporting the project also were present, including 41st City Council hopeful Anthony Herbert, as noted in The Local. Also testifying was Hunley-Adossa, who’s challenging James in the 35th District but didn’t mention her candidacy while at the podium. 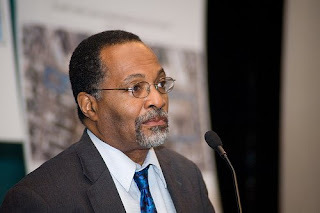 “Five years later, it’s long overdue that this particular project, Atlantic Yards, be built,” Hunley-Adossa said, adding “I deserve a round of applause from those who are in agreement.” Applause actually was somewhat tepid, given that the majority of project supporters had yet to arrive. Former Assemblyman Roger Green (right), now teaching at Medgar Evers College, called developer Bruce Ratner “ a person of good will and integrity” and said that, given the current unemployment rate, especially in the housing projects in his old district (now represented by Hakeem Jeffries, who was not at the hearing yesterday). He said MAS calls on ESDC for a Supplemental EIS and to reconsider certain aspects of the plan. Given the apparent reorientation of arena, he said, “it makes little sense to demap Fifth Avenue,” and also Pacific Street between Carlton and Vanderbilt Avenues should be left open rather than used to create a superblock. "The new modifications abandon the disclosed overarching goal and principal benefit, purpose and use of the project, which is to eliminate blight," he said. "In the meantime, the ESDC has not disclosed any credible independent feasibility analysis of the project as a whole and in its parts." Travis Lock of the Salvation Army praised Forest City Ratner for planning to provide an intergenerational facility. “It is not here, because the Atlantic Yards project has been delayed,” he said. He said that while FCR has sponsored dozens of basketball clinics, long term benefits have not arrived because the project has been delayed. Actually, the intergenerational center would be in Phase 2, and the timetable is very uncertain. “When we are doing being used by Forest City Ratner,” he said, “you won’t hear a peep out of Forest City Ratner.” He closed with his angry attack on Markowitz. 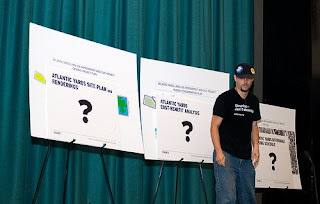 When Goldstein took the stage, he put placards on top of each of the three posters: the AY site plan, the phases of planned eminent domain, and an overhead photo. His placards had headlines—AY site plan, AY cost-benefit analysis, AY affordable housing schedule--but question marks instead of images. Where could it be set, he mused: the old Soviet Union? China? 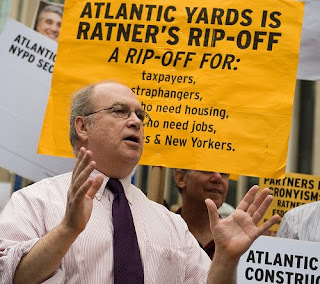 Alan Rosner, who co-wrote a 2005 White Paper on security issues, said, "I am here today to thank Mayor Bloomberg and Police Commissioner Ray Kelly for issuing a report that for the first time states the City can no longer support Atlantic Yards as specified in the Modified General Project Plan." "This report, Engineering Security: Protective Design for High Risk Buildings, provides the ESDC with criteria and a method for determining which of the City’s endless potential targets are in the very highest risk category." "Using those standards, both the Arena and Building 1 rank as high-risk, while the adjacent Atlantic Ave. Station has been a known target since 1997," he continued. "With three high value targets in one convenient, easy to reach location, AY will become one of the city’s highest risk targets." "Early last year, after the DHS and the NYPD met with FCR, securitizing the arena helped push its cost up over 300 million dollars," Rosner testified. "As the Daily News writes, that is one big bottom line reason for Gehry vanishing, for FCR’s turn to value engineering, and for the ESDC being forced to issue this Modified Plan. Were it not for lawsuits hiding the fact, the security issue has already cost this project over a year’s additional effort." Here's FCR's MaryAnne Gilmartin on why the developer hasn't yet met with the cops: designs aren't ready. Several project proponents responded to testimony from opponents. 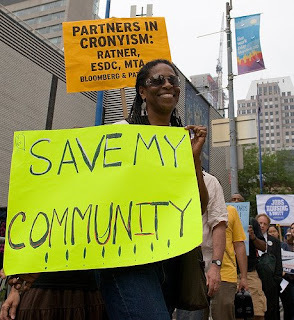 “It sounds like we heard tales from the crypt a minute ago, and we heard insults about our borough president, and that gets us nowhere,” commented Daisy Dobbins, a member of Faith in Action, the little-known CBA signatory founded as the All-Faith Council of Brooklyn. “It’s amazing that after six years, a few are taking over the rights of many,” he declared, adding that, “When Bruce Ratner asks for tax money, I don’t think it’s unrealistic to give it to somebody who’s going to create tax revenue.” (There’s no accurate estimate of the latter. The affordable housing issue got an airing—if not a particularly factual one—during the second part of the hearing. Maisha Morales, a displaced small business owner and a Fort Greene resident, acknowledged she was torn, feeling both critical of the project but noting that “my people--people of color” were supporting the project. “The development I want is not 20% affordable housing; the development I want is 70% affordable housing,” she said, not acknowledging that Forest City Ratner’s plan is supposed to be about 35% affordable—though, of course, there are many questions about exactly to whom it would be affordable. An ACORN member—I believe it was Debbie Tiamfook—responded by saying, not unreasonably, that 70% affordable was not practical. She was cut off by heckling, but the issue is a lot more complicated. Actually, FCR paid more than market for some housing—but it was far less than the perceived value of the new development rights, and it was bolstered by $100 million from the city. And people sold under the threat of eminent domain. 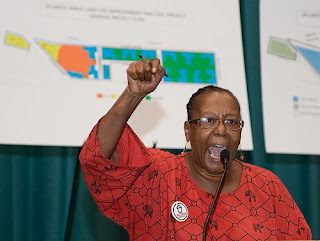 Bertha Lewis, CEO and Chief Organizer of ACORN, was pugnacious, as usual, declaring the project “a national model.” “It is finally time to make this a reality. You want to know who’s gonna make sure that the housing is affordable?” she asked. Except that Lewis, not unlike FCR’s MaryAnne Gilmartin on July 22, did not actually mention the potential rents. 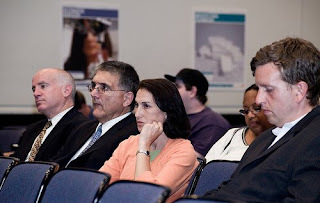 Earlier, when I had tried to ask her during a break how much ACORN owes Forest City Ratner, she blew off the question. After Lewis spoke ACORN’s George Finley said, improbably, that the affordable housing in the contract signed with “Forest Ratner” had to be available to those earning $20,000 or less. That’s not true. As the chart linked here shows, very few of the units--as of 2006, before the Area Median Income has gone up considerably--would go to those earning under $20,000. David Pechefsky, the Green Party candidate for the 39th Council District, said that, rather than repeat what’s been said about urban planning, he wanted to address the issue of financial viability. He noted that last week, at the informational meeting, he asked about Forest City Ratner’s internal rate of return--which had not been voluntarily made public by the developer, but had come through in some documents--and FCR refused to answer. His point was never addressed by the affordable housing advocates who spoke later. Alan Fishman, co-chair of the (city-funded, in part) Downtown Brooklyn Partnership, spoke as the chairman of board of the Brooklyn Academy of Music (BAM). Later, Michael D.D. White of Noticing New York caught up with Fishman and found out that, no, the BAM board was not consulted. Several people pointed, as some did in 2006, to what they consider the transformative potential of the project, with statements that some may have interpreted as threats. “If this thing is not getting taken care of”—a reference, seemingly, not just to Atlantic Yards but the struggles in Brooklyn for jobs—there’s going to be chaos,” he said. “This project was supposed to go forward a long time ago,” declared Darnell Canada of ReBUILD, which places workers at construction sites. 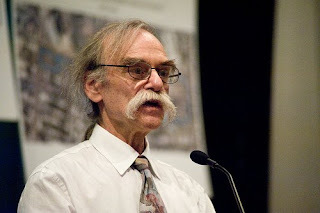 At one point, architect (and Park Slope Civic Council trustee) Gilly Youner, who turned her back on Markowitz when he spoke, referenced Forest City Ratner's anti-urban design for the Atlantic Center Mall, quoting Bruce Ratner as saying it was "built inside-out to keep out 'tough youth.'" (Actually, the quote was "tough kids.") Ratner, of course, has pledged to do better, and the mall went unmentioned by supporters. There was some interesting jousting in the auditorium for about half an hour into the second segment of the hearing. Rev. Clinton Miller of Brown Memorial Baptist Church in Clinton Hill, an ally of Assemblyman Hakeem Jeffries, led about 15 men from his church into the auditorium, an effort—as he said earlier this week—to help ensure that the hearing was orderly. One of the men with Miller got into a dispute with another man—a construction worker?—and the cops had to smooth things out for a moment. Montgomery and James, of course, are project opponents, while Jeffries has been more on the fence. But Miller seemed to be saying that he was taking care of his people no matter what. He went on to acknowledge that “We’re all just animals… and we all just gotta eat.” A “Build It Now” chant emerged from the crowd. He went back to his “circle” reference, leaving many in the audience befuddled, including--as the video shows--ESDC attorneys Matlin and Petillo, having a chuckle after a very long day.